From beautiful tablescapes to autumnal decor, Thanksgiving presents a wonderful opportunity to spruce up your home. You'll find ideas for centerpieces, place cards, menus, leftover take-out boxes, garlands and more to create your best holiday home yet. Continue to 2 of 38 below. Announce the feast you prepared for Thanksgiving by creating a menu on a pumpkin by hand writing all the dishes on the front. Continue to 3 of 38 below. Help everyone find their seat for Thanksgiving with these super easy to make pine cone place cards that you can make inexpensively by gathering pine cones outdoors and using small pieces of paper to write each guest's name one. Continue to 4 of 38 below. Dress up your table by painting several small pumpkins gold and arrange them down the center of your table this Thanksgiving for an easy seasonal centerpiece. This easy paper pumpkin DIY is a quick and inexpensive way to decorate your home and tablescape with seasonal squash. Each pumpkin will only take you about 5 minutes! Continue to 6 of 38 below. For the finishing touch to your pumpkin spiced cake this Thanksgiving, make your own falling leaves cake topper that showcases the beautiful fall colors of red, yellow and orange. Continue to 7 of 38 below. Pumpkin pie is a Thanksgiving staple, so whether you bought one or made one at home one easy way to make the pie extra special is to make your own stencil and some icing sugar to write give thanks and eat pie for a photo worthy dessert that everyone will want to post on Instagram. Continue to 8 of 38 below. Set the table with your own set of give thanks napkins with a free iron-on transfer template that you can be used on a set of plain white napkins for quick holiday decor. Learn how to re-create this stunning pumpkin and sunflowers centerpiece that will stretch across the length of your table. Even if you have no previous experience in flower arranging this do it yourself centerpiece is something everyone can do on their table. Continue to 10 of 38 below. Let the kids help to decorate the table by having them paint leaves with the help of a stencil onto a large piece of paper to make a falling leaves table runner perfect for Thanksgiving. Continue to 11 of 38 below. For an original centerpiece idea for this Thanksgiving create a succulent planter out of a pumpkin to sit in the center of your table. Continue to 12 of 38 below. Get stamping and create your own set of turkey napkins to use this Thanksgiving by stamping a turkey design in your favorite colors. Encourage your family to take a moment and write down what they are thankful for on small note cards that you can leave beside everyone's place setting. Over dinner, everyone can then share what they wrote down to get the conversation started. Continue to 14 of 38 below. Soft candle light is a simple yet elegant way to make any dinner table more lovely, and these copper striped candle holders would be perfect at a fall dinner party. Continue to 15 of 38 below. Print this lovely label to go over the bottle of wine you will be serving this Thanksgiving to make it seem extra festive. Continue to 16 of 38 below. Showcase the beauty of fall gourds by turning them into small vases perfect for displaying a few fresh flowers on your table. Keep bottled drinks such as a beer or wine cold and easily accessible for guests at your Thanksgiving celebrations by serving them in a homemade pumpkin cooler. Continue to 18 of 38 below. Stamp your own geometric table runner to add some pattern to your table with this affordable DIY idea. Continue to 19 of 38 below. Transform regular small pumpkins by dip dying them in metallic paint to create decorative vases. Continue to 20 of 38 below. Send guests home after the dinner is over with an extra slice of pumpkin pie in this cute printable box. Showcase the beauty of fall by hanging leaves with reasons why you are thankful written on each leaf as beautiful backdrop for your thanksgiving meal. Continue to 22 of 38 below. Leftover wood pallets used for shipping are easy to find for free, and the scrap wood is the perfect thing to be repurposed into a rustic artwork perfect for your home this Thanksgiving. Continue to 23 of 38 below. Create your own muslin and orange fabric thankful banner that you can re-use everything thanksgiving by hanging it over your fireplace mantel or in your dining room with clothespins. Continue to 24 of 38 below. Pick up a few packages of corn husks from the grocery store and glue them around a straw wreath to create a stunning way to dress up your front door this fall. Pick up an inexpensive framed artwork at the thrift store and paint the artwork with chalkboard paint and decorate it with a custom thanksgiving message using chalk for a spectacular way to dress up your home for Thanksgiving. Continue to 26 of 38 below. Attach a small Thanksgiving card along with the hostess gift you bring to the Thanksgiving dinner you are invited to this year with the help of this free printable card template. Continue to 27 of 38 below. Inflate a large balloon and write on it what you are thankful for and tie the balloon to a weight on the floor for a quick decoration for Thanksgiving this year. Continue to 28 of 38 below. Print one of the three Thanksgiving chalkboard artwork designs that you can frame for easy last minute Thanksgiving decor. Dress up your fireplace chalk deer that is perfect from Thanksgiving all the way to Christmas as you can write a Thanksgiving message one side and Christmas-themed message on the other. Continue to 30 of 38 below. Tie together some gold tipped feathers to create an elegant garland perfect for Thanksgiving. Continue to 31 of 38 below. Pies are a popular dessert choice for Thanksgiving, so for the grand finale of your family meal enhance your homemade or store bought pie with a beautiful floral wreath pie topper that you can make yourself. The extra fancy pie is certain to impress everyone at the table. Continue to 32 of 38 below. 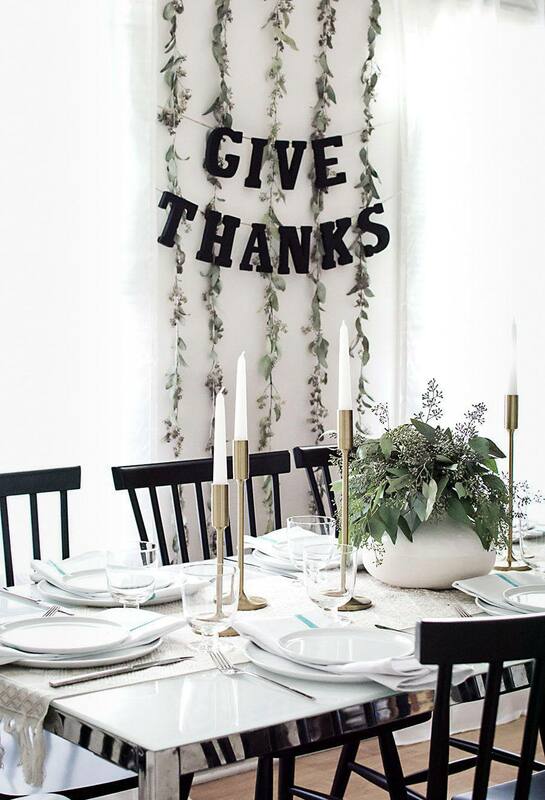 If you are looking for some modern ways to decorate your home this Thanksgiving try making your own simple give thanks garland with simple black letters that you can hang on your walls. Transform plastic toy turkeys into the perfect Thanksgiving place card holder with a toothpick, gold paint and some paper with this DIY that looks professional that your friends and family will be surprised you did not buy the place card holders at a store. Continue to 34 of 38 below. After a huge feast on Thanksgiving, not everyone might have room left in their stomach for dessert, so send guests home with an extra slice of pie in a handmade take home box that will perfectly fit one slice of pie. Continue to 35 of 38 below. Help ensure you are not left eating Thanksgiving leftovers all week by sending each guest home with some of the leftovers in a stylish leftovers take home bag that you can make by printing the design template on a paper bag. Continue to 36 of 38 below. Remind your guests in a subtle way to think about what they are thankful for this Thanksgiving by making these simple napkin rings which you can make by printing the template onto premade tags. Make any dessert you serve look instantly Thanksgiving themed, such as cupcakes or slices of cake by sticking in a printable cupcake topper into the top. Continue to 38 of 38 below. Give plastic pears a stylish new look with a bit of paint to craft some timeless place cards that you can reuse year after year for Thanksgiving to help guests find their seat at the table.